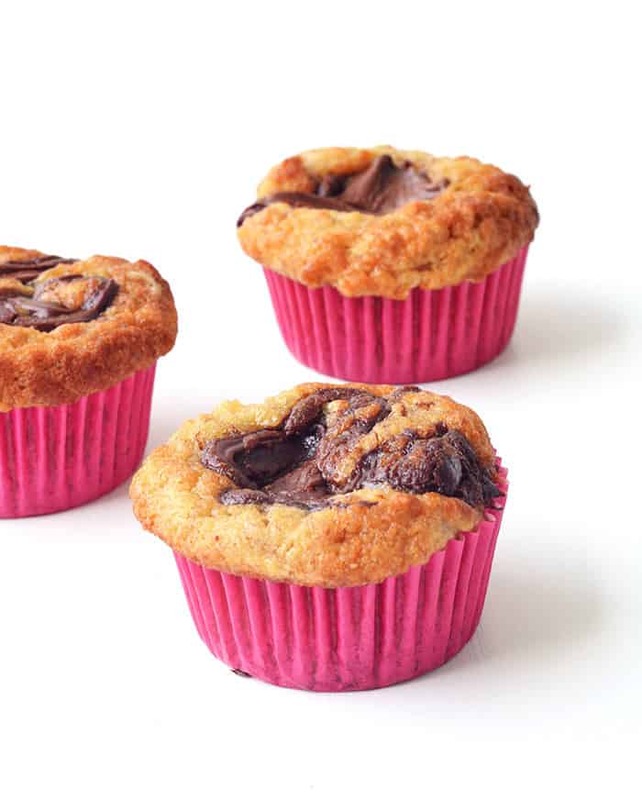 Banana + Nutella + chocolate = WINNING. 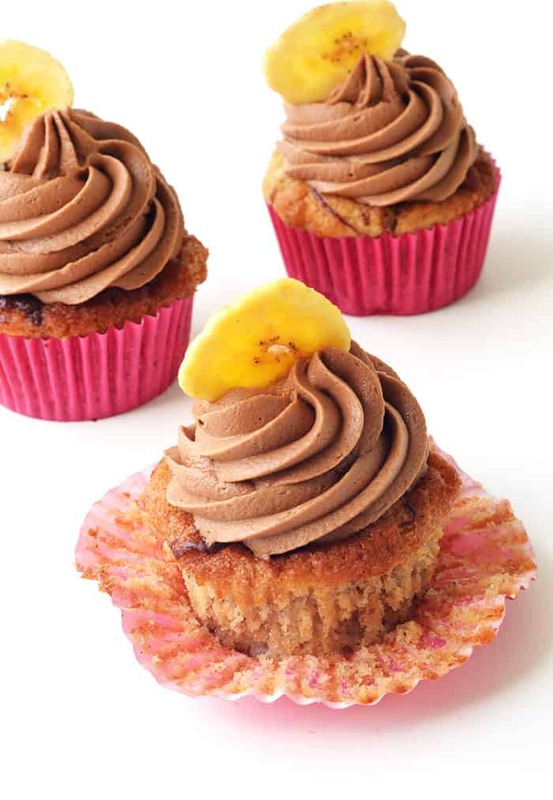 Introducing my new favourite treat – Nutella Banana Cupcakes. 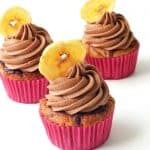 Soft and fluffy banana cakes with a touch of cinnamon, complete with a dollop of Nutella that gets baked into the cake, followed by swirls of homemade chocolate buttercream that is oh-so-fluffy. It all started when I had spotty overripe bananas staring back at me from my fruit bowl. There is no way I will eat a banana once it goes spotty so my only answer is to get baking. 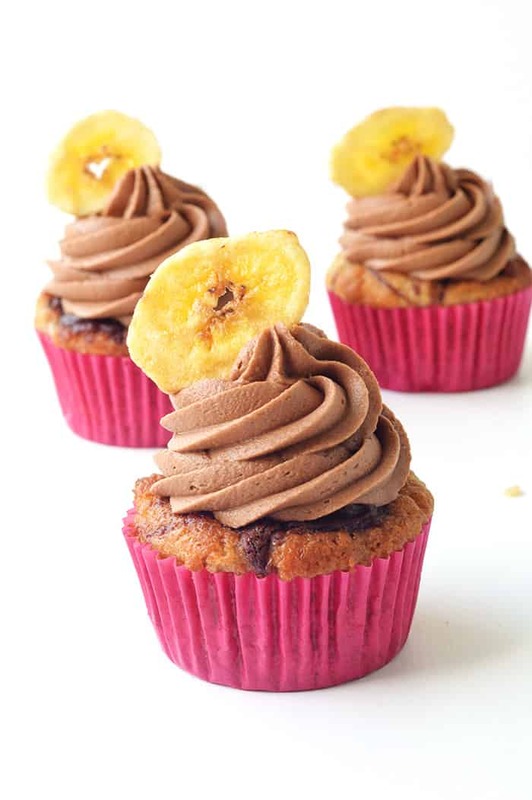 I had serious cupcake cravings but what’s a banana cupcake without a little bit of Nutella? I knew I was onto a good thing right then and there but the final touch? Fluffy chocolate buttercream made from real chocolate. Yes, friends, it really is one special cupcake. 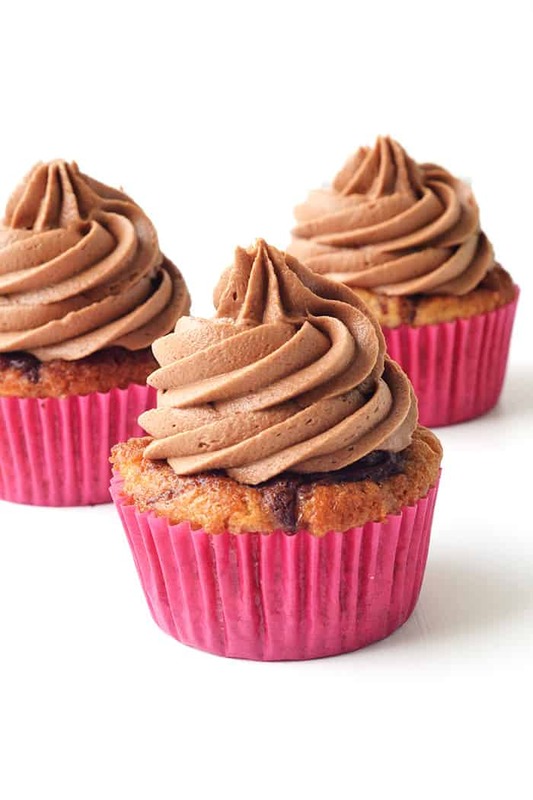 For a festive touch, add banana chips on top or you could decorate with chocolate sprinkles. It is NO secret that I am a huge Nutella fan. See HERE for evidence. So I couldn’t resist adding a big dollop of Nutella to each and every one of these cupcakes. They are then baked to golden perfection. What you end up with is a lovely contrast of light and fluffy banana cake with a gooey pockets of baked Nutella on top. Then there’s that chocolate buttercream. My FAV frosting. If you beat that butter as best you can, you will end up such a light and fluffy frosting that just about melts in your mouth. I just love using real melted chocolate in my frosting for texture and added flavour. So tell me, how is your weekend going? Can you believe Christmas is on its way? I have been so enjoying the warm weather over here because we’ve been able to get out and enjoy the beach most weekends. And even though the water is still freezing, we try to make sure we get in and go for a swim because it’s undeniably refreshing. I think we’re going to really enjoy the Sydney summer. This weekend I also made my first Christmas treats for the blog. I’m very excited to share them with you very soon! But do leave me a comment or send me an email if there is a recipe you would like to see this Christmas. And if you are starting to think about Christmas treats, check out our Christmas collection for some neat ideas. 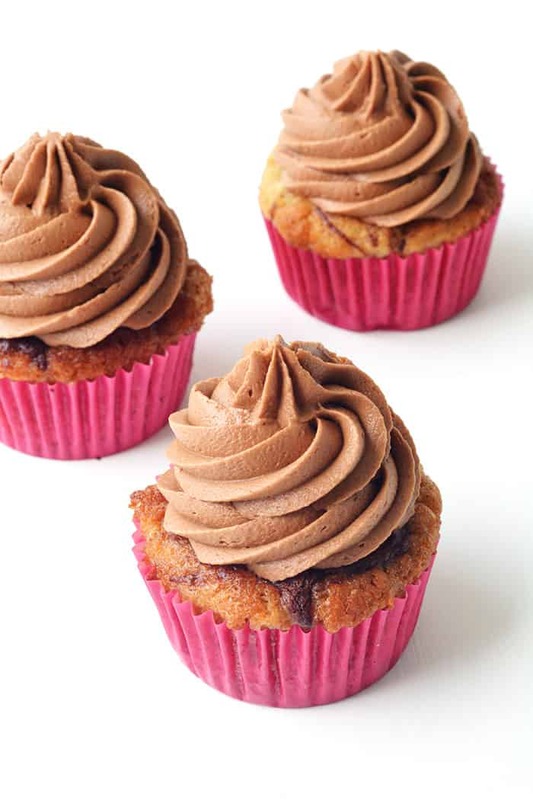 Soft and fluffy banana cakes with a dollop of Nutella and swirls of homemade chocolate buttercream. Line a muffin tray with cupcake liners. Preheat the oven to 180 C (360 F). In a large bowl, sift the plain flour, baking soda, baking powder and cinnamon. Peel and mash the bananas well. In a separate large mixing bowl, add the butter and sugars and beat with an electric mixer for a a couple of minutes until it is creamy, pale and combined. Add the vanilla and beat again briefly. Then add the eggs, one at a time, beating in between until creamy. Finally, add the dry ingredients to the butter mixture, along with buttermilk and the mashed banana. Gently fold with a spatula until just combined. Transfer the mixture into your cupcake liners, filling 3/4 full. Then add a teaspoon of Nutella onto each one and gently swirl with a knife. Bake your cupcakes for approximately 18 minutes. Then transfer to a wire rack to cool completely. Next, add in your melted chocolate to the buttercream mixture, ensuring the chocolate is still smooth and melted but is not warm. Beat until the chocolate is completely mixed through. Transfer your frosting to a piping bag fitted with a large circular tip. Pipe swirls onto each cupcake. Decorate with a banana chip right before serving. Oh yum!! 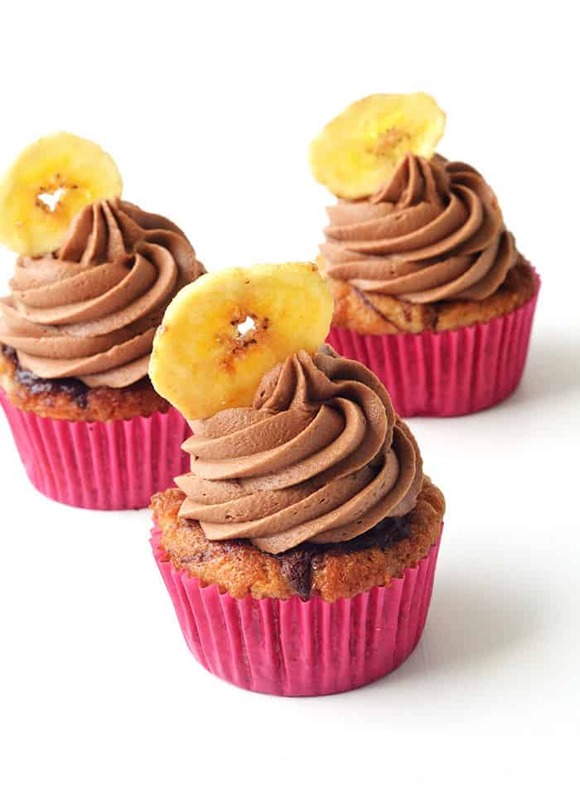 Banana and chocolate are one of my favorite combinations! This is such a delicously awesome combination! I’ve been known to dip an afternoon snack banana into the jar of nutella for a hint of something sweet, but I think they would be much better off baked into a tasty treat together! I’m glad you are already enjoying the beach! We haven’t been yet, but we’ve got a family holiday at the sunshine coast coming up and I can’t wait! I can’t wait to see what you’ve baked up for Christmas! I can’t believe I’ve never thought to put banana and Nutella together! I think I’ve been majorly missing out! Gosh, I love this place. Never have I ever left here without a severe sweet tooth, but I’m totally okay with it. My hubby is going to be head over heels for these things! Need to try them. Nutella and banana is a wonderful combination. And I love the banana chip decoration on top! A double nutella hit? Oooh my my these look good! Over a week ago, I started baking cookies. It saves a lot of time if I start a little early, and then freeze each batch. Your cupcakes look fantastic!